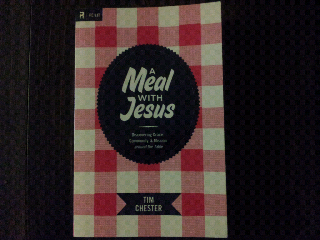 We just finished reading through the book A Meal with Jesus by Tim Chester. I thought it was a really great piece about how we as the Christian community need to get out and start inviting people to the marriage supper of the Lamb; mostly by inviting them to our own suppers, and using that food and context as a foretaste of great things to come! What an incredible challenge to open our door to absolutely anyone. We were really inspired (though we don't agree with everything he says), so you should read the book too.